Does your dream vacation in Italy include a leisurely day exploring the Tuscan hills? I am sure you want to see all the sights of the big cities in Italy – Rome, Venice and Florence. And most people cannot resist the call of Sicily, the Amalfi Coast or the Italian Riviera. But I also recommend taking a day to explore the countryside and small towns of Tuscany. We rented our Tuscany villa in Bagni di Lucca, just outside of the pretty medieval walled city of Lucca. This pretty series of villages along the river Lima was the perfect base to explore the hills of northern Tuscany and the Garfagnana region. You can just as easily plan a day trip from Florence or Pisa to this area. Driving west from Bagni you follow the river south west towards Lucca. In this part of Tuscany towns are built on the banks of several rivers that wind their way through the fertile hills. Where there are rivers, you also find bridges. The beautiful arched Ponte della Maddalena or Ponte Del Diavolo (Devil’s Bridge) is an 12th century footbridge crossing the Serchio River. The origins of the dual names of the bridge come from the life size image of the Virgin Mary (Maddalena) that was once found at the foot of the bridge and an interesting legend. According to local lore the devil helped build the bridge in return for the soul of the first being to cross it. The devil was tricked by clever Saint Julian who saw to it that a dog was the first being to cross the bridge. Whatever the name, it is a very pretty bridge worthy of a visit. Continue alongside the Serchio through hills and valleys bathed in sunlight. Pass through ancient towns and villages dotted along the roadside. Notice the grey stone buildings and terracotta roofs typical of the region. Eventually you reach the market town of Castelnuovo di Garfagnana where you can explore the fortifications of Rocca Ariostesca, poet Ariosto’s castle, and the pretty duomo. 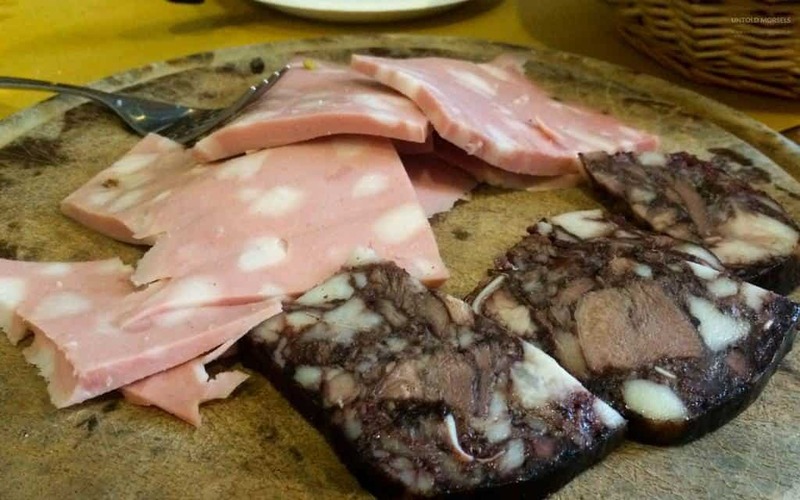 Time to stop for lunch and hopefully you made a booking at Osteria Vecchio Mulino to try the local specialties. Garfagnana is famous for farro and we tried the most delicious salad made from the grain as well as cured meats and cheese paired with local honey. If you are lucky you might see the largest mortadella round possibly ever made. But the most memorable dish was truffle bruschetta. This dish was so moreish and delicious I can’t bear to think that I may never taste it again. It goes without saying that the wine was excellent also. After lunch take a leisurely drive through the hills. Seek out views across the densely wooded landscape from vantage points such as the villages of Montefegatesi or Tereglio. Mountain goats climb the rocky hills below much as they have done for centuries. 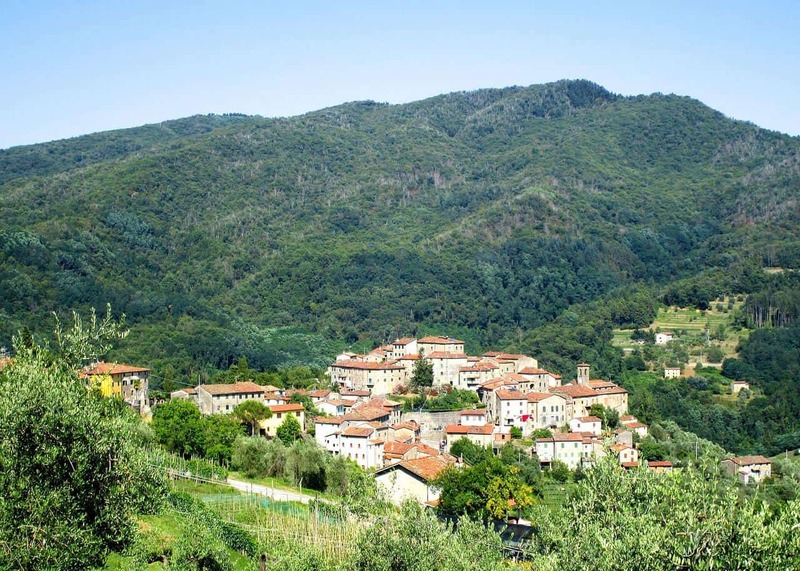 Here you gaze down on the villages of Bagni di Lucca, once the summer playground of Napoleon and his family. No doubt the original attraction was the thermal springs and baths known for their health benefits. These days you can find the baths in the village of Ponte a Seraglio. We preferred to return to our villa for a swim and a walk down to town for (another) simple but incredibly delicious truffle pizza. In the bars and osterias of the villages you ease into local life. The atmosphere is relaxed and the pace is slower. This is Tuscany. Here the hills are quiet save for the sounds of crickets chirping. You wander down sun dappled pathways lined with stone walls, past olive groves and chestnut trees. The local bar serves some of the best gelato you have ever tasted and the path on your walk home is lit up by a thousand fireflies. You contemplate selling everything to make this your permanent home. Then you drift off to sleep in the warm summer night air. And there you have it. A perfect day exploring the hillside towns of Tuscany. Bellissimo. I love how so much of Italy appears frozen in time, yet not outdated or lagging behind in any way, how do they manage it? I love your blog and Tuscany is one of my favorite destination. so lovely there. when am there I don’t want to go back home. Thanks Juli for your kind words. I feel the same way about Tuscany – it is a magical place. Love your blog! Tuscany seems so amazing and can’t wait to get there! Renting a villa sounds like it is a great great idea! Tuscany has been on my list for as long as I can remember. I’ve seen so many movies with the Tuscany backdrop. This just makes me want to visit the place more. I better move it up the list sooner than later. Thanks for sharing. Tuscany sounds a very interesting place. I would love to see those fireflies at night and explore the wonderful places. Lovely photos you have here. Your pictures are lovely and truffle brushetta? What have I been doing with my life? I have never even heard of this amazing treat. I have a fascination with bridges and I thought the arched bridge in your blog was beautiful! I don’t think I’ve ever seen a bridge like that, really unique and definitely a highlight for me of Tuscany’s charm. I think Italy is my favorite country that I have been to. Would love to go back and explore more in Tuscany, it is beautiful. Sounds so wonderful and romantic. I would love to go to Tuscany for an anniversary trip without the kids. Such beautiful photos! I love the cultural history, too, like the story of the bridge. Fascinating! Such a lovely read. I loved the story about the bridge! It is always fascinating to hear all the stories intertwined with places. I haven’t been to Tuscany, but I’m already in love with it. That bridge is wonderful! You’ve just reminded my why i need to visit soon!